This is an excerpt of a MakeSh!t proposal submitted for artist-designed Mini Golf at the Walker to take place in summer 2013. Fingers crossed! UPDATE 1/9/13: WE’RE IN. CONCEPT: Once (maybe twice) in lifetime, something happens that transforms a favorite pastime forever. For the sport of Mini Golf, that time is next summer at the Walker Sculpture Garden. Roaming Hole Gardens (RHG) employs the game’s familiar assets and rules but with one crucial twist: the target hole roams. In lieu of taking her usual shot, a player may instead relocate one of 6 topiary plugs into the open hole, thereby opening a different hole—a new target!—for the round. The new hole becomes everyone’s object—that is until another player chooses to move the hole instead of swinging for it. With this deceptively simple change, the sport attains a mind-blowing new level of challenge, strategy and competition while remaining easy enough for anyone to play. MATERIALS: 6 life-like mobile topiaries are made of outdoor-grade plastic for durability and ease of management. Each is anchored in a welded metal pot that allows it to be moved easily from one hole to another. 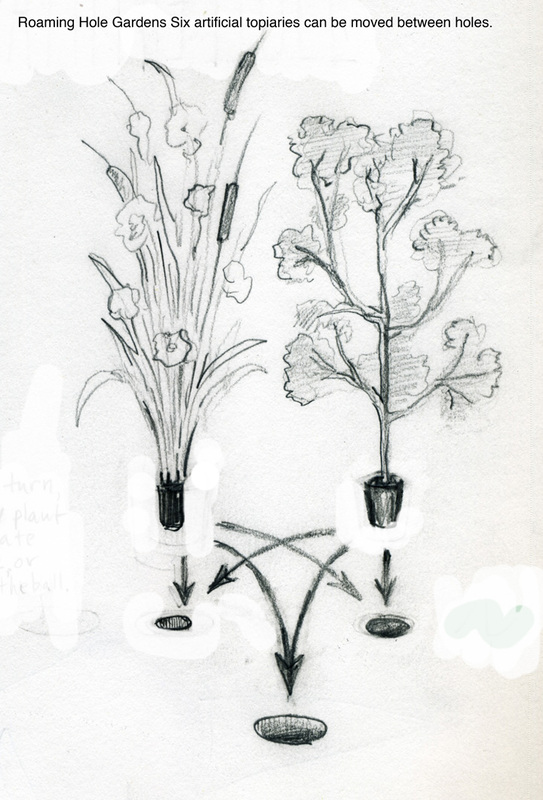 The arrangement of these artificial trees, shrubs, grasses and bouquets evokes a manicured English garden, reinforced by the symmetrical course design. 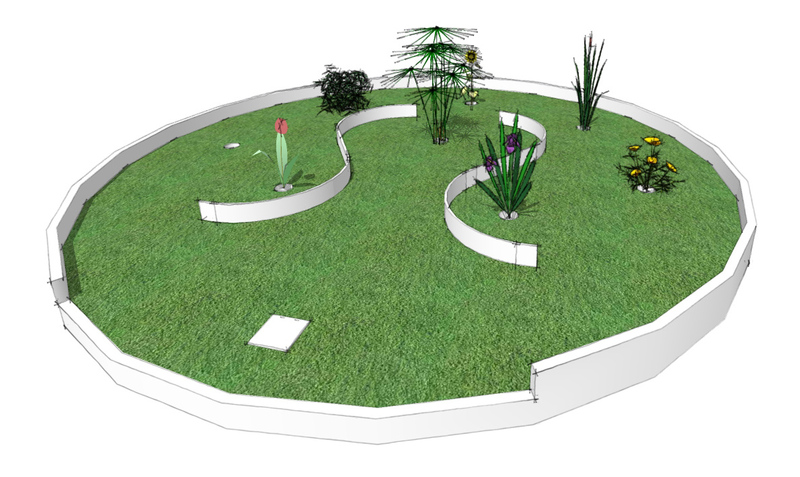 Other materials are tried and true mini golf: astroturf, plus simple walls and interior obstacles made of bent metal. 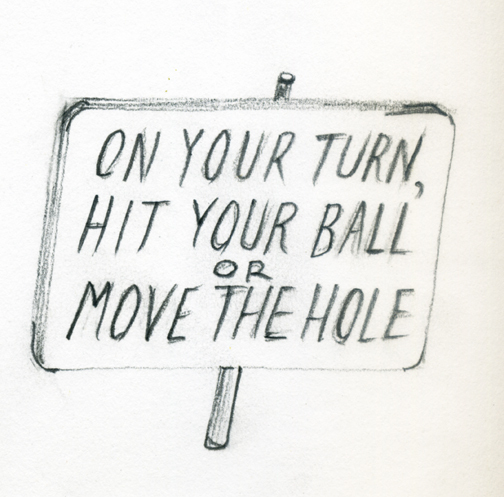 PLAYABILITY: Players are greeted at the hole’s start with one rule: “On your turn hit your ball OR move the hole.” The party’s first player may take a shot at whichever hole is then open (subject to the whims of the previous group) or use his turn to move the hole. RHG’s simple design means you are never more than a shot or two away from the target hole. But depending on how merciless your opponents are, it could take several more swings to finish (we recommend a 6-shot limit). Once any player sinks the hole, she collects her ball and stands by as others complete the round.